Andy Warhol (1928-1987) is one of the most iconic figures of twentieth-century art, a highly enigmatic personality who not only altered the definition of art but also left in his wake a vast and staggeringly complex record of his daily activities. The Andy Warhol Catalogue Raisonné, the definitive record of the artist's paintings, sculptures and drawings, cover some 15,000 works produced by Warhol between 1948 and 1987. Also included is an incredible array of rarely published source material, including newspaper scraps and movie star publicity stills that inspired Warhol's boundlessly fascinating life and career. The Andy Warhol Catalogue Raisonné was initiated in 1977 by Thomas Ammann. The editors Georg Frei and Neil Printz began primary research in 1993 and have been advised throughout the project by the distinguished curators and art historians Kynaston McShine and Robert Rosenblum. 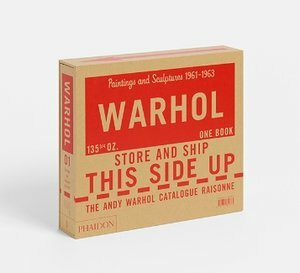 Experts from the Andy Warhol Foundation personally examined the vast majority of Warhol's works and began a thorough review of his archive, which at his death consisted of some 1,500 cardboard boxes, flat files, and trunks filled with source material, memorabilia, correspondence and junk mail. The editors examined works in museum conservation facilities and discussed them with conservators, submitted works for review by the Andy Warhol Art Authentication Board, and interviewed Warhol's assistants and colleagues to assemble a customized database of works unparalleled in Warhol scholarship. All of their findings are documented in this unprecendented project. Each annotated catalogue entry includes the works title, date, medium, dimensions and present owner, followed by a record of inscriptions, provenance, exhibitions and literature. Related works are linked by general introductory texts that explore historical circumstances, shared themes and studio practices. Supplementary figures to the texts illustrate source materials that Warhol appropriated for his works: newspaper articles and advertisements, soup cans and publicity stills, as well as related drawings, works by other artists, and studio and exhibition views. Volume 1 includes classic and much-prized Warhols such as the Campbell Soup paintings, images of the iconic figures of Marilyn, Liz and Elvis, and early self-portraits.